This Portal provides information on implementation of the PIP Framework Partnership Contribution (PC) through 31 January 2017 only. For 2018 onwards, click here. 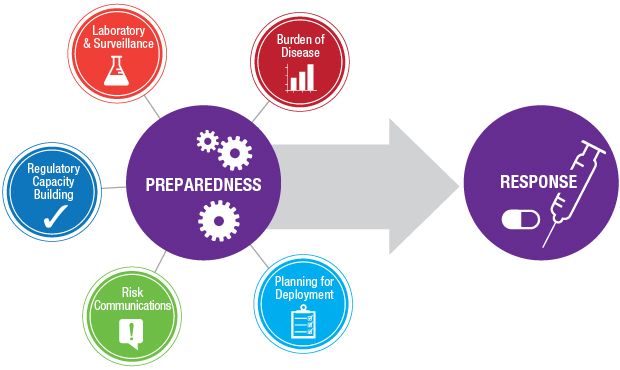 The Pandemic Influenza Preparedness (PIP) Framework is an international arrangement adopted in May 2011 by the 194 Member States of the World Health Organization. The Framework brings together Member States, industry and civil society to work together with WHO to ensure that the world is better prepared to respond to pandemic influenza. to promote the fair and equitable access to benefits, such as vaccines and antiviral medicines, that arise from such sharing. The Framework establishes two mechanisms to facilitate access to benefits: the Partnership Contribution (PC) and the Standard Material Transfer Agreement-2 (SMTA-2). This Portal provides you access to information about the Partnership Contribution. The Partnership Contribution is an innovative approach to improve the world’s readiness for pandemic influenza, and its ability to launch a robust response. The Partnership Contribution is paid to WHO every year by influenza vaccine, diagnostic and pharmaceutical manufacturers that use the WHO GISRS, for example by receiving virus materials (see PIP Framework section 6.14.3). The total yearly amount that WHO is to receive is US$ 28 million which is based on the estimated costs to run the WHO GISRS (see PIP Framework section 6.14.3 footnote 1). While the Director-General decides how the contributions should be used, the decision is based on advice and consultation with the Advisory Group, as well as interaction with industry and civil society (see PIP Framework section 6.14.6). The Executive Board plays a central role, deciding on how much is allocated to preparedness on the one hand, and response on the other (see PIP Framework section 6.14.5). preparedness requires long-term investment, particularly when capacity building requires training and transfer of knowledge. In light of the foregoing, for the period 2012-2016, the Executive Board decided on the following division of PC resources: approximately 70% to preparedness measures and 30% to response activities, recognizing the need and usefulness of flexibility in allocating funds. In addition, in March 2013, the Director-General accepted the recommendation of the Advisory Group that a portion of PC funds, not exceeding 10%, averaged over the next 4 years (2013-2016), be used by the PIP Secretariat to enable work, either on-going but at risk, or not yet undertaken because of lack of funds, so as to meet the objectives of the PIP Framework (see WHO World Health Assembly report A66/17 Add.1). The Portal aims to increase transparency and accountability around the use of the PIP PC funds, more specifically detailed in the high level PIP PC Implementation Plan (2013-2016). The Portal will be updated regularly as indicated in specific sections. The mention of specific companies or of certain manufacturers' products does not imply that they are endorsed or recommended by the World Health Organization in preference to others of a similar nature that are not mentioned. All reasonable precautions have been taken by the World Health Organization to verify the information contained in this Portal. However, this information is being published without warranty of any kind, either express of implied. The responsibility for the interpretation and use of the material lies with the reader. In no event shall the World Health Organization be liable for damages arising from its use.